L to R: Oliver Towers, president of Dowty Propellers and Arun Kashyap, VP, Engineering and Maintenance for SpiceJet. The new seven-year Dowty Propellers agreement with SpiceJet, signed this week at the 2018 Farnborough Airshow, culminates a joint process of developing a comprehensive support package tailored to meet the airline's growing volume of flights on domestic and international routes. SpiceJet currently operates 22 Q400s, which will increase with the airline's decision to acquire 25 more aircraft. 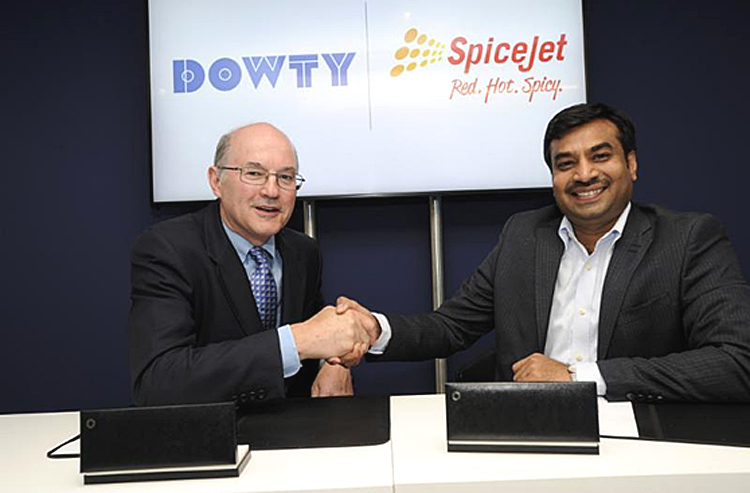 "This latest contract marks a new step in our ongoing relationship with SpiceJet and an endorsement of our innovative approaches to provide local support to customers across the globe," said Oliver Towers, the President of Dowty Propellers. Dowty Propellers' in-country support resources are centered at Hyderabad - a SpiceJet operational hub in south-central India - where a purpose-built propeller repair shop was created in a joint initiative with SpiceJet. Providing the capability to repair propeller systems on-site since 2016, the Hyderabad facility has significantly reduced turn-around time (TAT) and enhanced the repair work efficiency. The Hyderabad propeller repair shop has the capacity to handle the increased service activity for SpiceJet's enlarged Q400 aircraft fleet, and Dowty Propellers will augment its stock of parts and components at the facility accordingly. "Having the support of Dowty Propellers is key to ensuring the availability of our Q400s in meeting the demand for air travel created by India's economic and business growth," said Arun Kashyap, Executive Vice President of Engineering & Maintenance at SpiceJet. "We look forward to taking this new step in our relationship with Dowty Propellers." Dowty Propellers' R408 propeller system on the Q400 incorporates six all-composite blades with an advanced swept design and optimized airfoil sections. Featuring fail-safe electronic controls, this propeller system's modular configuration eliminates mechanical control linkages to the cockpit, while facilitating the individual removal and replacement of blades.